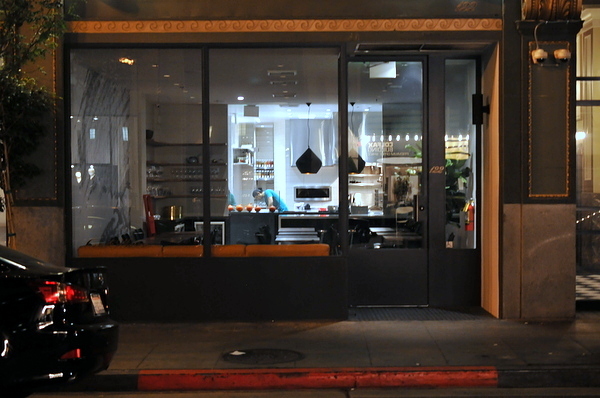 I'd been hearing a lot of noise about Orsa & Winston in recent months, the third restaurant from Chef Josef Centeno in as many years. Despite having just opened a few weeks ago and not even having a sign on the door, the restaurant has been garnering some very strong reviews. 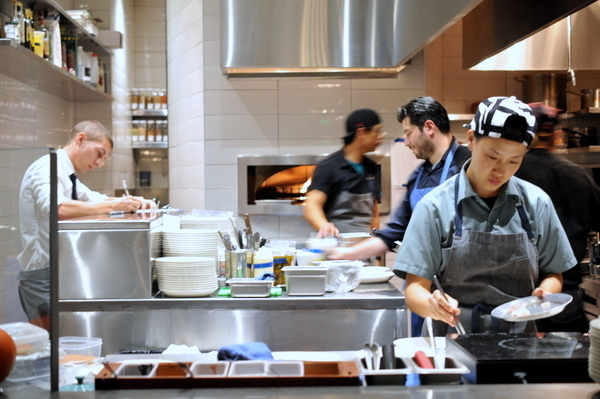 Named for his two dogs, Orsa & Winston started life as an Italian small plates concept but picked up a heavy dose of Japanese influence along the way. The final restaurant offers four different fixed menus: a 4-course family style, the standard 5-course, a 9-course omakase, and a 20+ course Super Omakase. Naturally we opted for the Super Omakase which is only offered at the 4-seat chef's counter. I first encountered Chef Centeno while he was executive chef at the Lazy Ox Canteen. After a very successful three year stint at Lazy Oz, Centeno has made a name for himself with Baco Mercat and Bar Ama both more casual the former a gourmet sandwich shop and the latter a tex-mex gastropub. Given his recent experience its easy to forget that Centeno started his career at the three-star Daniel in New York and was chef de cuisine at the vaunted Manresa in Los Gatos. 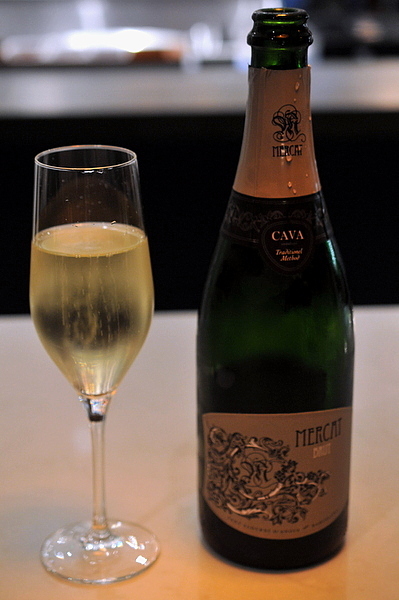 We kicked off the meal with a very dry cava. I initially thought this was especially made for Josef Centeno's restaurants but it turns out the reference is to La Boqueria. I thought the zero dosage champagne was a bit one dimensional, dry and crisp with a unpleasant funk. 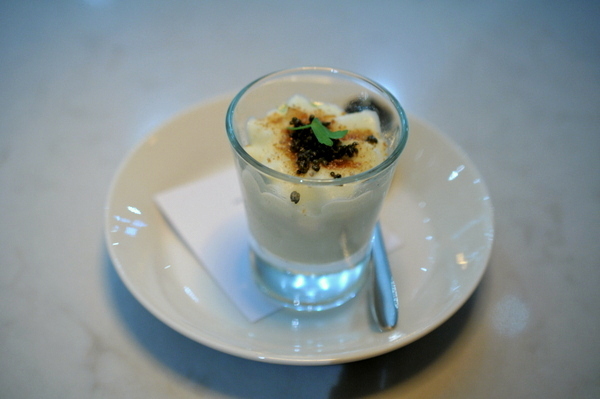 The amuse was a delicate little panna cotta topped with bits of crumbled wheat cracker. The lovely textural interplay compliments the sweet licorice-laced overtones of the custards which morphs into a faintly bitter finish. Our second course was a play on Boquerones. The anchovy filet is wrapped in a sapid golden wrapper giving it a nice crunch. The pickled vegetable bits add a bit of flair but the real star is the interaction between the oily fish and the sweet and sour like honey sauce. 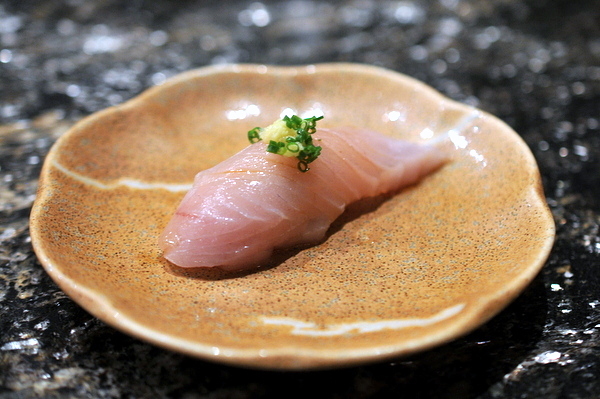 The kanpachi started out fairly conventional complimented with shiso and shishito but the burst of citrus potency and finish of heat were unexpected. 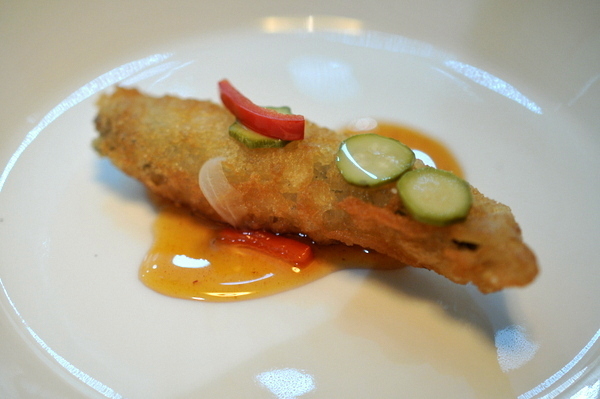 Chef Centeno was channeling a bit of his time at Manresa for this course. I was a bit taken aback on the first bite when I noticed a stinging astringency from the sherry vinegar that I didn't remember being so apparent from previous encounters with the Aperge egg. 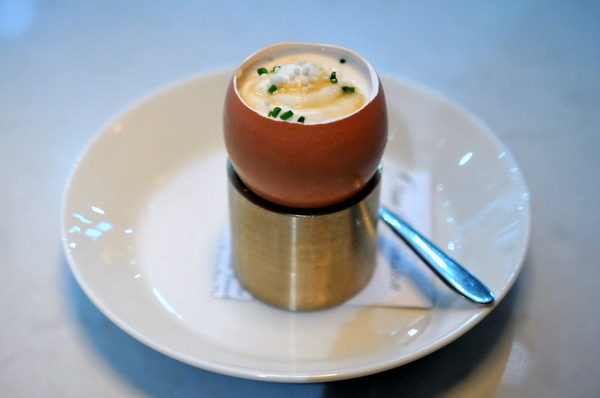 The flavors evened out on subsequent bites thanks to the moderating effects of the coddled egg yolk. Personally I prefer the more refined version at Manresa but some of my companions preferred the breakfast version thanks to the more robust lusty flavors of the pancetta. Arguably a bread course we were given six of these warm fluffy balls of wonder to share between our party. The freshly baked bread has a cotton-like fluffiness to it coupled with just a hint of milk driven sweetness. Accompanying the bread were a perfectly creamy mound of warm oregano butter and a piece of pork testa (head cheese) baked for 12 hours at 200 degrees. 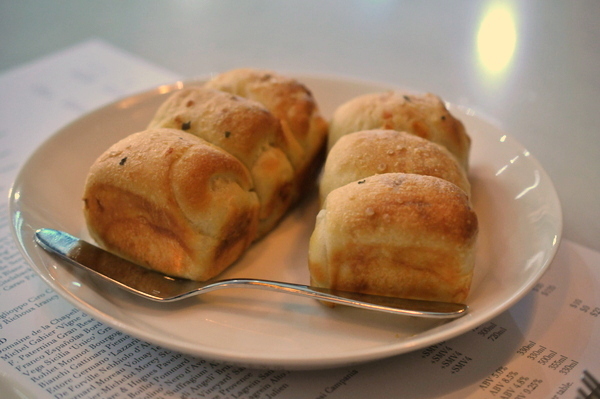 Personally I thought the bread stood beautifully on its own merits as did the fatty sliver of porcine goodness. 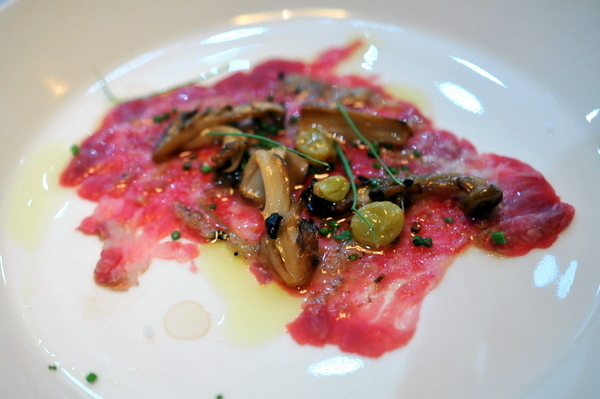 I really enjoyed carpaccio when I started getting into fine dining but the dish feels played out these days which made Centeno's version a real breath of fresh air and one of my favorite courses of the night. The meat itself is more of a textural element adding a slick densely viscosity that I quite enjoyed but it is the interplay of the accompaniments that really sets this dish apart. 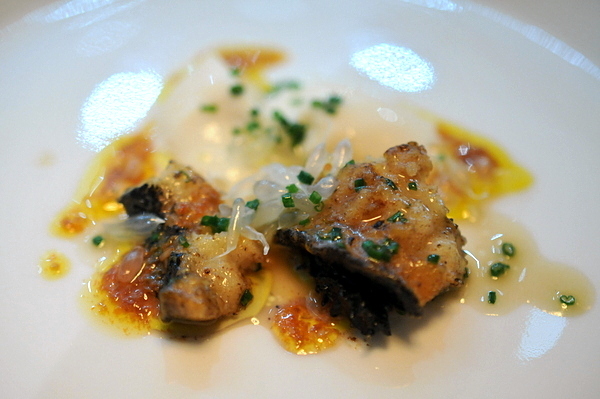 The pickled mushrooms have a bright vinegary tang which contrast well with the champagne grape raisins. The sardo adds a profound Roquefort-like pungency to the dish while the black truffle shavings bring a touch of luxurious earthy musk. I would have liked a knife to cut the bits of stringy tendon but thats more of a nit than a real complaint. 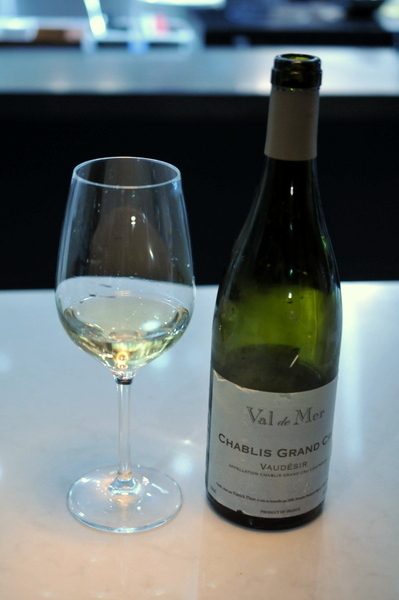 Moving onto white wine we popped open a bottle of young Chablis from the highly touted winemaker, Patrick Piuze. 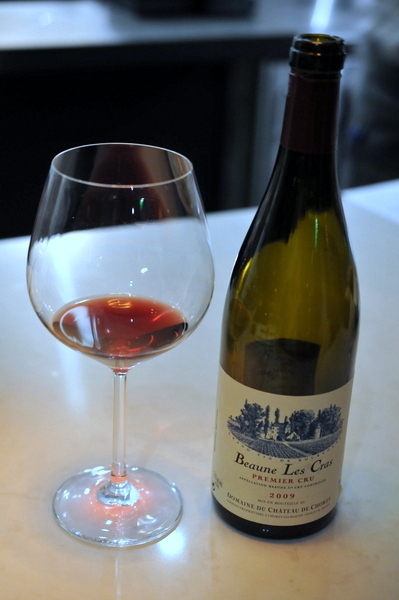 The wine has a laser-like mineral-laced acidity that is immediately apparent but there is a surprising depth of ripe stonefruit and floral on the finish. 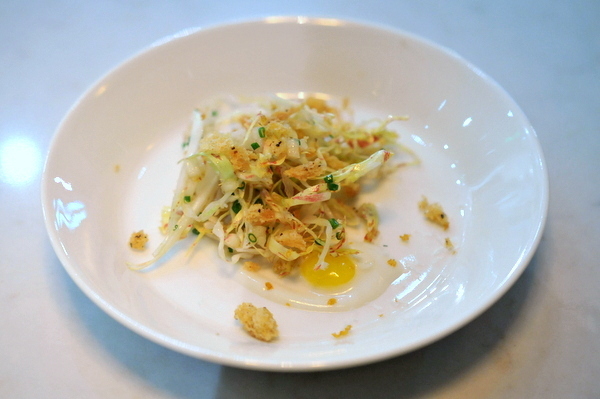 Next up was a salad of shredded castelfranco also known as white radicchio. On its own the vegetable is almost stunningly bitter but mixed with the "dressing" of mango and gorgonzola the flavor changes to an elaborate bitter and sweet interaction. 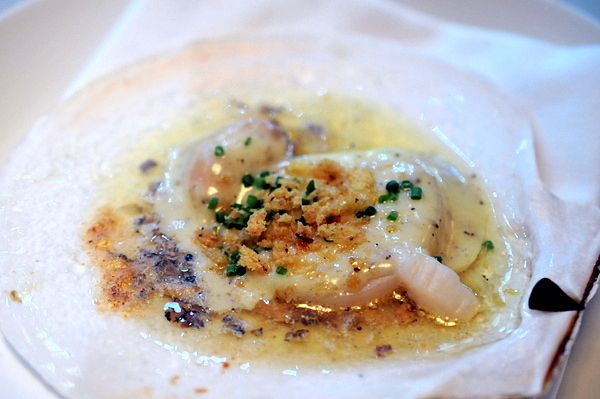 I have some experience with Centeno's razor clams, His preparation at Lazy Ox remains one of the best that I've ever had and this preparation continues the trend; highlighting and elevating the bivalve's strengths. The clams have a fantastic snappiness coupled with a gentle salinity highlighted by the umami-laced dashi and beet emulsion. The garbanzos have a lightly verdant flavor and a dense starchiness that brings a sense of substance to the clams. The cardoon is definitely the star here, crisp, succulent, and herbaceous perfumed with an earthy musk from the porcini slivers. The small anchovy bits in olive oil pack an outsized amount of flavor, bringing a sharp fishy twang that livened up the austere mix of mushroom and cardoon. The snap peas certainly lived up to their name with a pleasing crunch and along with an unexpectedly intense savor. The inherent grassy sweetness of the peas was deftly augmented by the floral sweetness of the candied lemon zest. The burrata seems to draw out the flavor of the various ingredients while adding a sense of heft to the dish. Despite the mix of humble ingredients the combination was surprisingly intricate and effective. 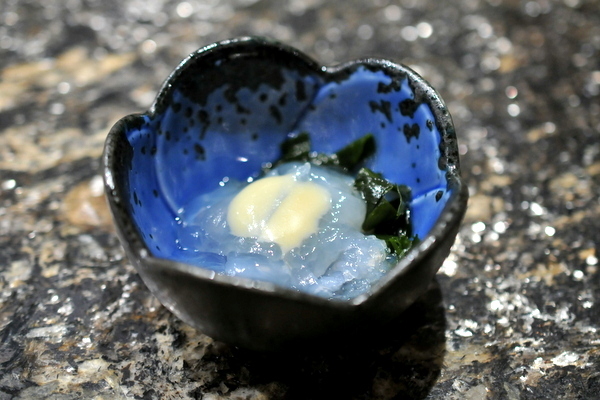 The live scallop comes swimming in a bath of clarified butter mixed with herbs and egg yolk. 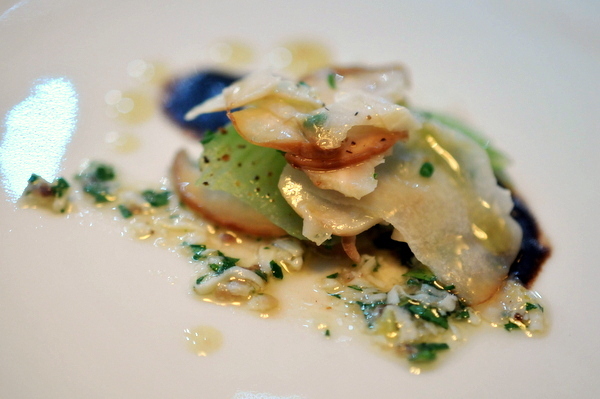 The mixture is further infused with truffle, an absolutely consummate pairing with scallop's sweet salinity. The scallops came with an unexpected treat, a small sac of roe. The roe has a deeper more pungent salinity and creamy texture that made me think of an oyster. Though the flavor was fantastic, I thought the texture was a touch rubbery though the rest of my party didn't feel the same way. 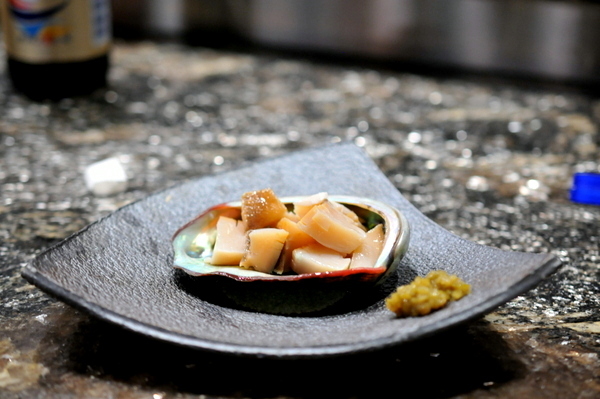 The abalone came out quite tender its slightly bitter saline deftly brightened by the pomelo juice sacs and the sweet onion juice. The real surprise was the burnt milk panna cotta, with a faint flavo reminiscent of an unsweetened vanilla ice cream, the milk acts as a medium for the rest of the ingredients. This was one of the more forthright courses of the night, steely livery goodness coupled with ripe sweetness from the jam. Our server told us a story about a 7 year old girl who said "this is too good to be chicken liver, it has to be foie gras." I certainly wish I had her culinary acumen when I was 7. 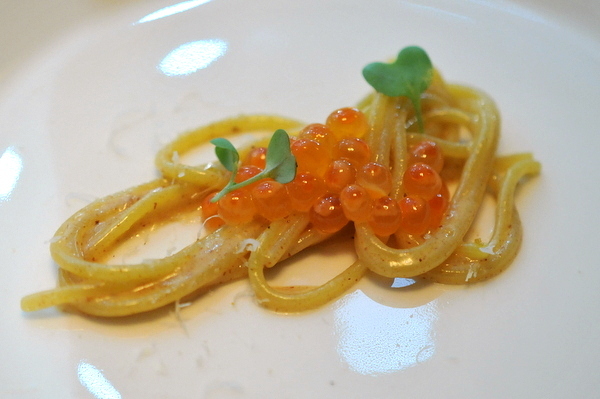 Another of the night's standouts the dense very al dente pasta has a simple yet satisfying Japanese flair thanks to the smoky pop of the salmon roe laced with a whisper of citrus. The flecks of cheese add an almost urgent savoriness that augments the cool umami flavor of the roe. It seems like theres a bad joke lurking behind the combination of mackerel and whore's sauce. Typically paired with spaghetti, Puttanesca is a tomato based sauce that became popular in the 60s. 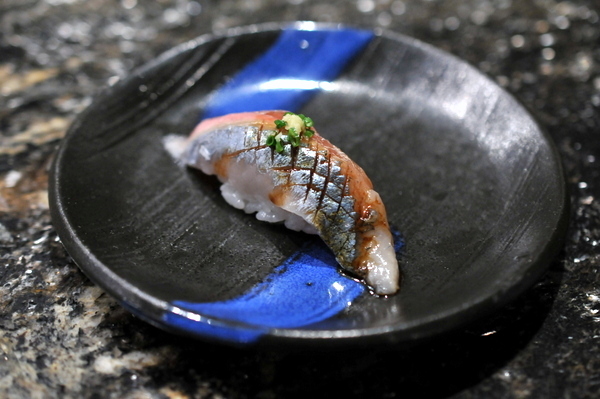 The mackerel was cooked beautifully with a still rare slightly translucent center. 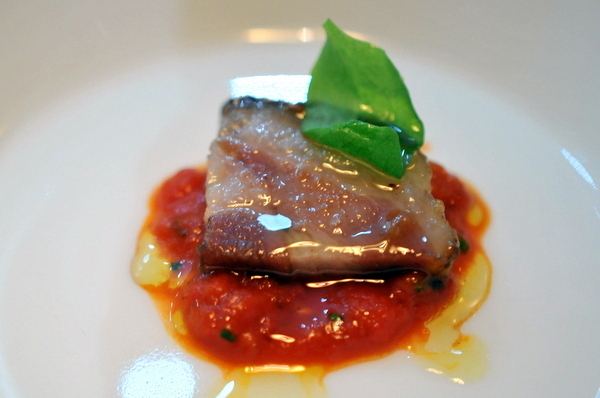 The three tomatos pack and intense acidity that enlivens the oily twang of the fish. 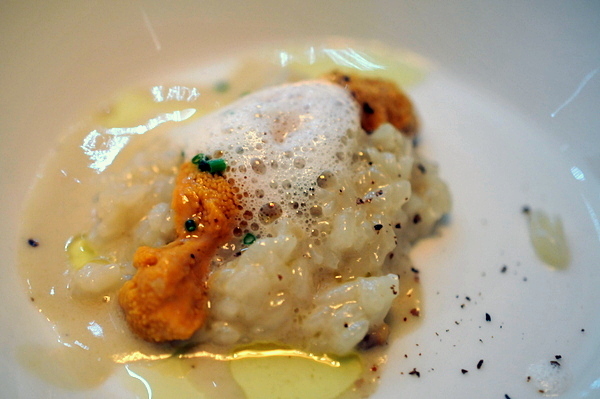 This dish combines two of my favorite things risotto and uni. Unfortunately it is very similar in terms of structure and flavor to the spaghettini we just had earlier. 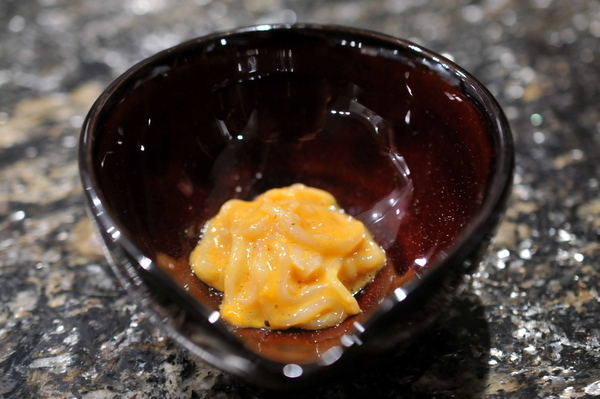 Like the preceding course, the risotto combines starch and cheese with the salinity of roe and a touch of citrus. A winning combination to be sure but just not optimally place in the meal. 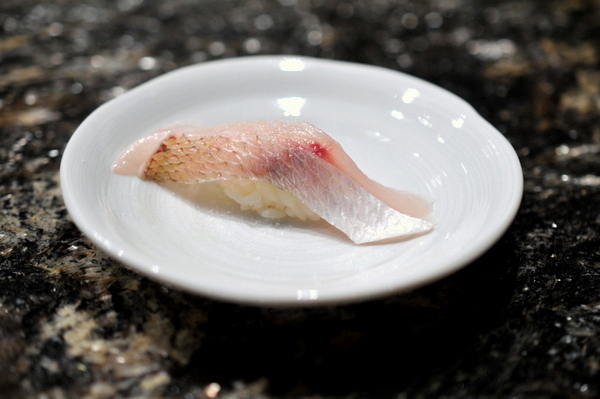 This course starts off with another slice of perfectly cooked fish. The Dory flakes under the lightest pressure from the fork. 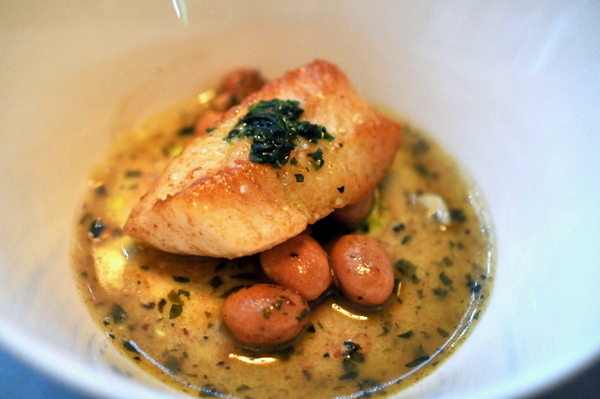 Each moist sliver of the fish is drenched with the herb laced sauce,while a touch salty it was a delicious combination. I'm not normally a fan of beans but the starch really worked wonders with the fish. 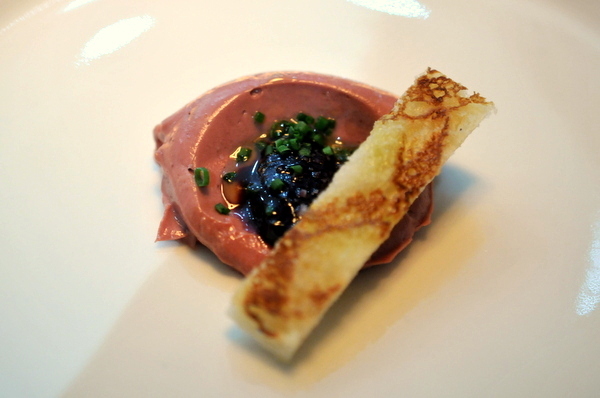 Our first meat course consisted of two slivers of bright red squab breast peeking out form under a fennel emulsion. The breast is topped with a small slice of crispy skin that augments its savor. 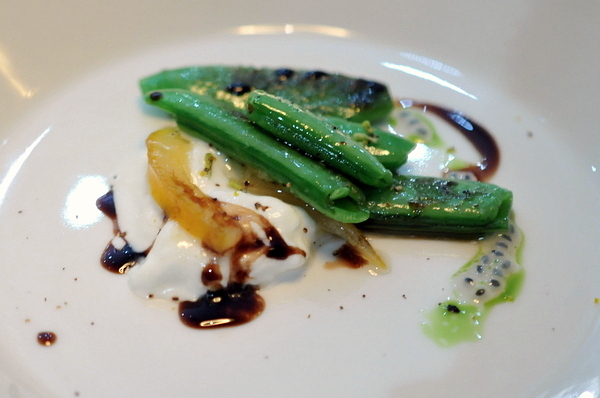 The squash was a bit sweet but restrained by the licorice flavor of the fennel. This was my favorite of the three final savories. The single sliver of ham is a fantastic mix of fat and moist lean meat covered in a rich honey glaze. Personally I would have been perfectly happy basking in the unadulterated fattiness of the ham but the chef didn't neglect the need for balance. The ripe tomato sauce was the polar opposite the ham, a brazenly tart acidic knife to cut through the porcine gravitas of the ham. 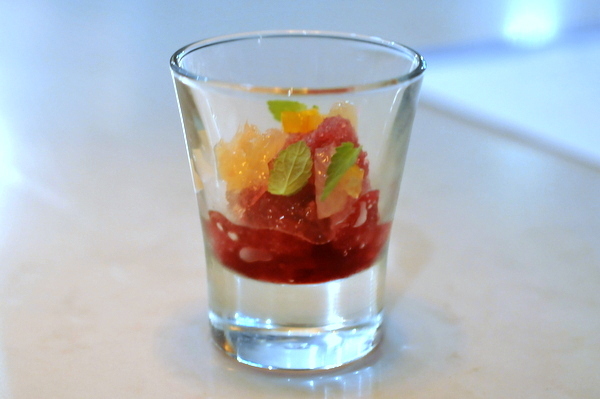 For our intermezzo we were given a shot glass full of dark red pomagranite granita topped with more candied lemon zest. The cool fruit mixture has a bracing chill and refreshing tangy sweet levity to it. I thought this was the weakest of the desserts the chilled fruit and granita feels identical to the previous course while the vanilla panna cotta didn't really add much. 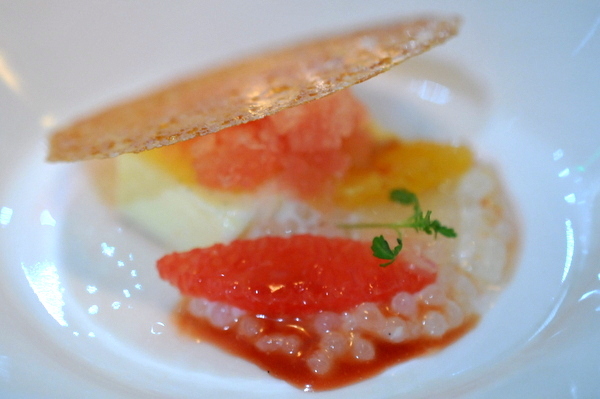 The moswt impressive part of the dish was the tuille, a crunchy disc of caramelized sugary sweetness. 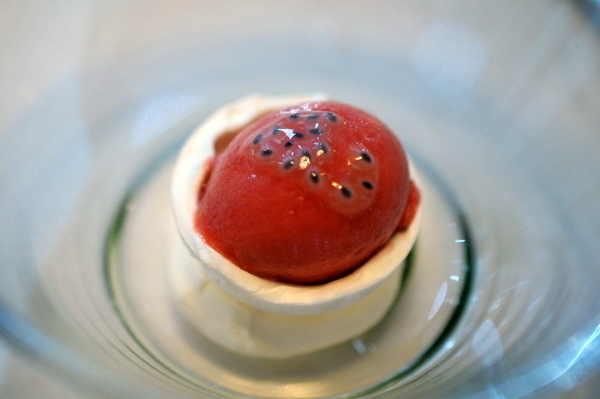 A third frozen fruit based dessert, the blood orange sorbet has a brash bitter acidity that highlights the sweetness of the airy meringue base. 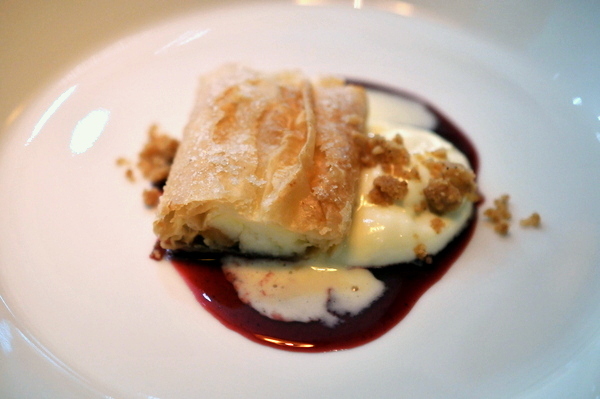 Despite being labeled a pear strudel I distintly tasted the flavor of bananas in this dish. Fruit aside, there is a distinct suguary crumble from the streusel and buttery crust of the strudel. 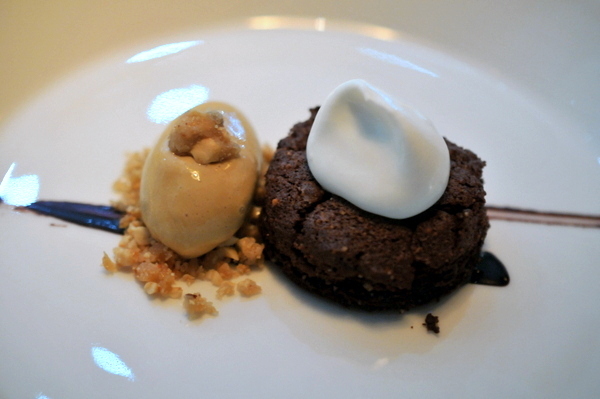 This was my favorite of the five sweet courses. The chocolate cake was moist, dark, and rich just what one would expect. Bits of hazelnut toffee add sweetness and crunch while the accompanying butterscotch-rosemary exudes a contrasting fragrant herbaceousness. 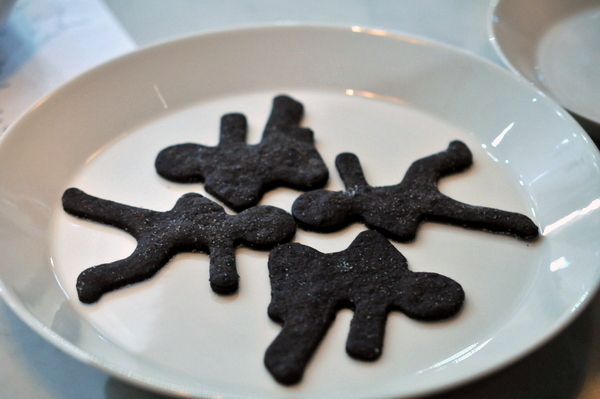 The meal ended with these enjoyable and fun shaped cookies, but a more elaborate slate of mignardises would have been more in keeping with the sophistication of the super omakase. One note for those considering the Super Omakase: the restaurant is still waiting on its final bar stools and going 4+ hours without a back rest can be a bit taxing. Personally I felt the food was more than worth the discomfort, but those with a bad back might want to hold off for a while. 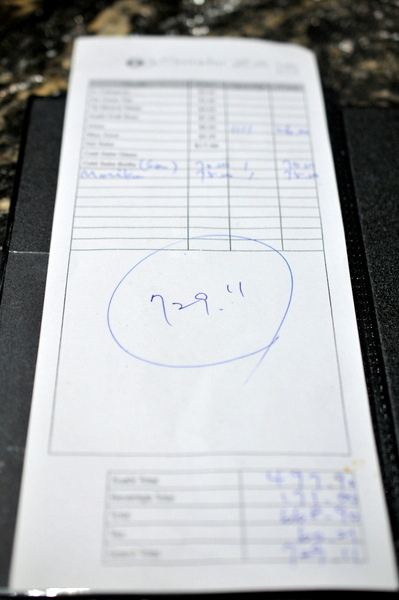 Speaking of the food, I thought Centeno's innovative menu defied easy quantification. 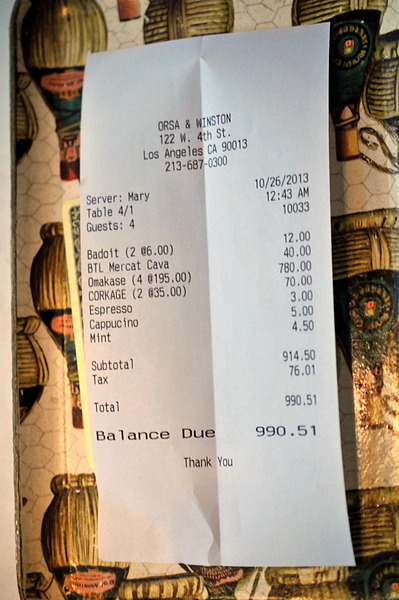 With creatively designed dishes and expert precision, Orsa & Winston represents a very successful return to Chef Centeno's fine-dining roots, easily the crown jewel of his Old Bank District mini-empire. Rumblings about a new Sushi Zo since late last year. The original Palms location earned a reputation as one of the area's top sushi restaurants on the strength of its pristine cuts of fish and the use of loosely packed warm rice. 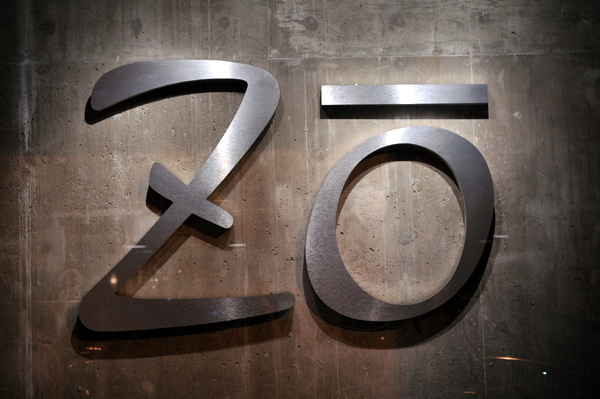 The new omakase-only restaurant, simply dubbed Zo, was originally slated to open in June but the inevitable delays associated with opening a new restaurant delayed things for a few months. Located on the first floor of The Medallion, a mixed use apartment and retail building, the space has a airy clean contemporary feel. Despite having just opened in mid September, early news about the restaurant has been quite positive. Not only is the food comparable to the old location, but if the rumors are to be believed the owner and head chef Keizo Seki has mellowed in his old age, becoming friendlier and less intimidating. 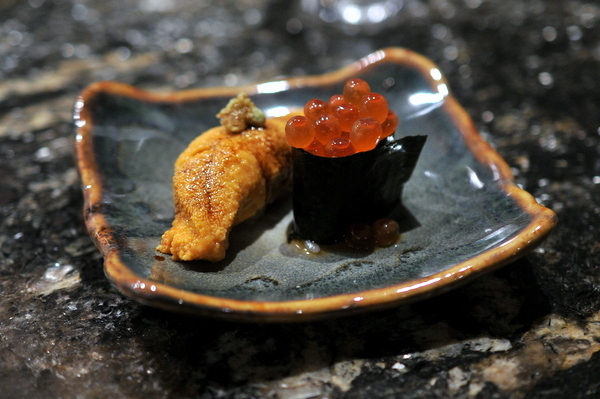 The meal started with a dainty Kumamoto. 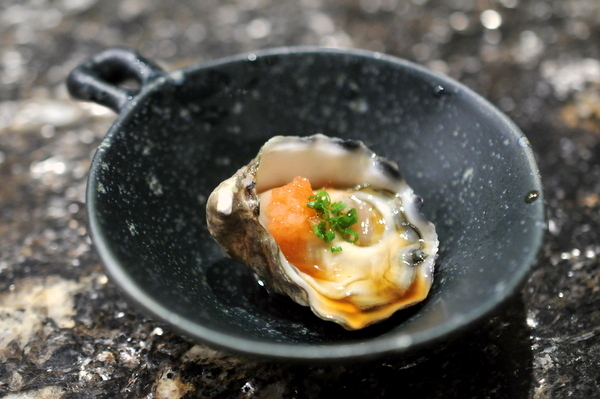 Dense and compact with a creamy lushness on mastication, the oyster was on the sweet side especially once the tang of the ponzu came into play. Next up were for thick pieces of Big Eye tuna. 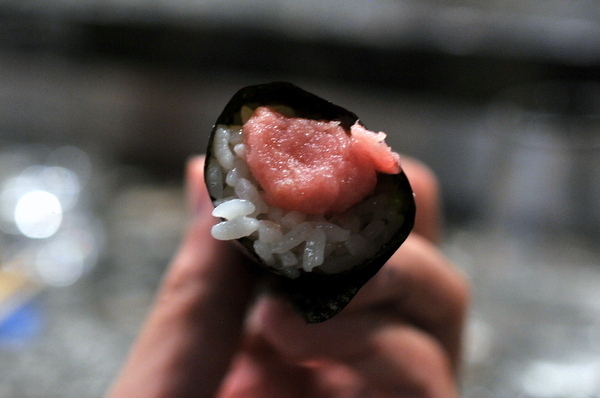 The flesh was a tactile joy weighty yet yielding to the bite, a generous brush of potent soy and bite of the wasabi provide most of the flavor. Moving on, my companions and I shared an abalone. The meat was cut into thick chunks giving it a dense rigidity that takes a bit of effort to bite through. 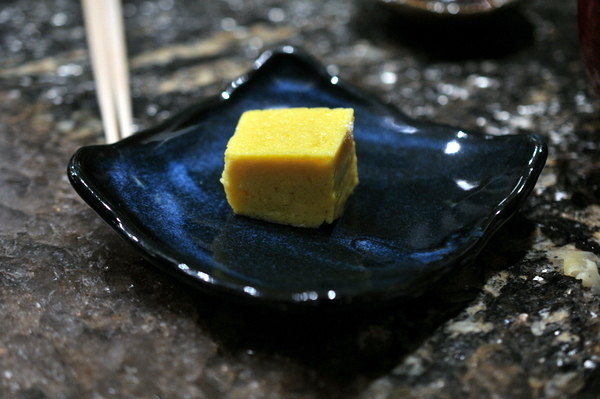 The accompanying yuzu kocho is fairly intense, at once salty with a fair amount of heat. I could smell the aroma of truffle as soon as this dish was set before me. 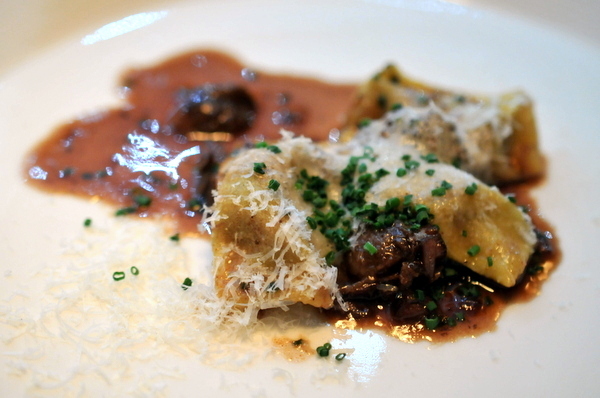 In fact my only nitpick with this dish was the intensity of the truffle. I didn't expect the squid to be particularly flavorful but I would have liked the flavor of the uni to be more apparent. Instead the truffle was the pervading flavor while the uni provides an underlying savory sweetness. This was one of the few new dishes and it was a very welcome addition. The translucent jellyfish was simultaneously snappy yet slick. The white miso comes on a bit strong but I was still able to detect a gentle salinity under the sauce. The appetizers dispensed with, we moved on to the nigiri. First up was a tender sliver of halibut that dissolved on the tongue leaving behind a melange of sweet nuttiness tinged with a bright acidity. 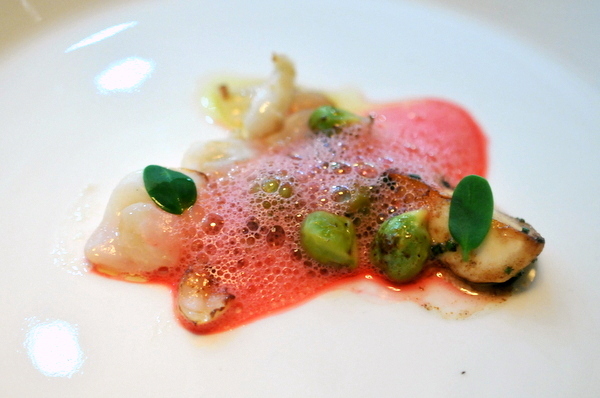 Next up was a beautiful pink tinged flesh was even softer than the halibut and loaded with subtly sweet oiliness. 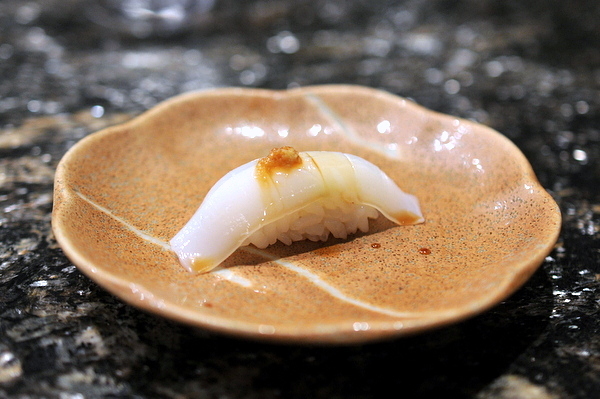 The nigiri came seasoned with a sharply contrasting ponzu and the spicy bite of ginger. 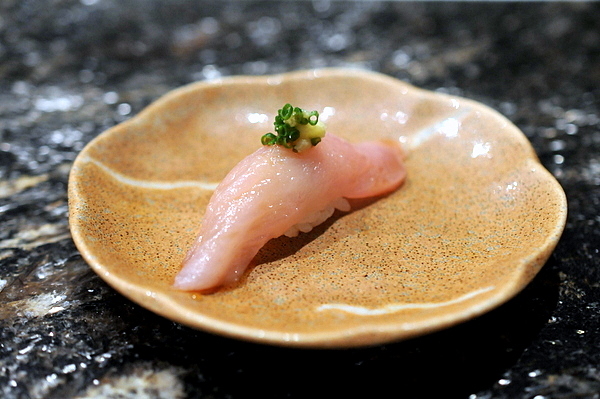 The Hamachi came served in classic fashion with little more than soy and wasabi. 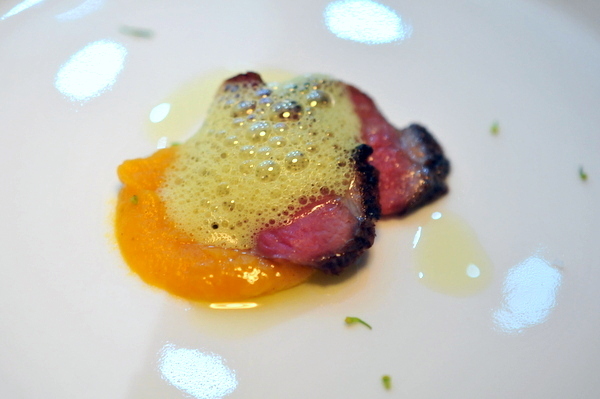 The simple flavors worked well to highlight the tender flesh and the lush oily savor. 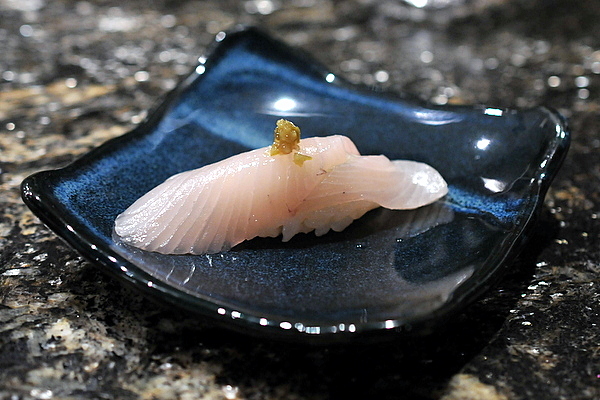 A fantastically balanced example of Aji, the fish had a pleasing firmness and a moderate flavor. 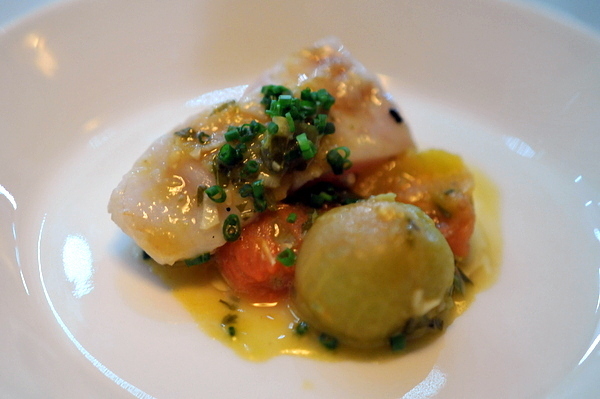 I noted a strong onion-y zest from the chives that complimented the clean savor of the fish. This was a textbook scallop with plenty of sweet salinity and a jellied firmness that evolves into a creamy slightly tacky mouthfeel upon mastication. 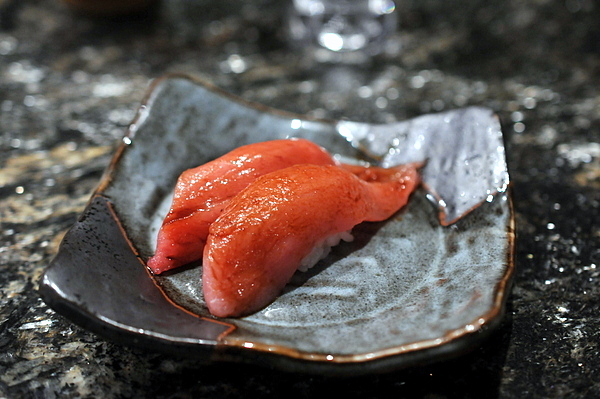 As always the toro is the only nigiri that comes as a pair. 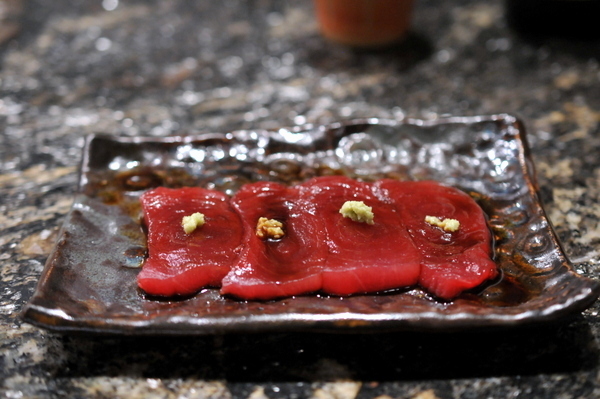 The toro came from the same Big Eye Tuna as the Akami sashimi we had earlier in the meal. Instead of the clean even texture of the lean tuna, the belly has a porous almost pillow-y feel and seems to exude a rich fishiness. I wonder if the absence of Bluefin is a conscious decision to go with a more sustainable fish or driven by more practical reasons like cost or quality. Pompano is a relative rarity at sushi restaurants that I've only seen before at Nana-san in Newport Beach. 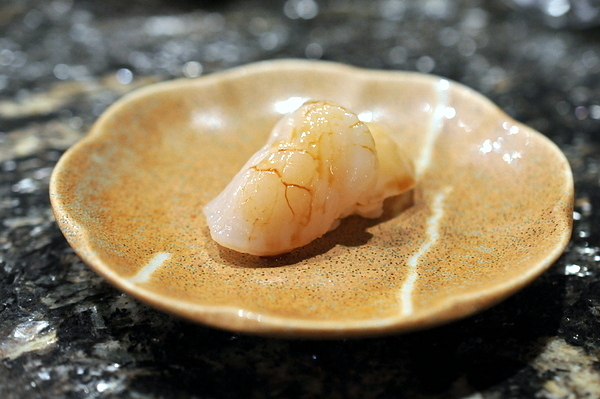 In contrast with my previous experience, this piece ran towards the milder side relying on the roasted shishito's fantastic bitter vegetal savor. A close cousin of the Yellowtail we had earlier, the Amberjack was much leaner with a markedly firmer texture with clean lines running between the individual segment. The flavor was similarly more subdued with a lightly sweet twang complimenting the whisper of oil. My first run in with this fish was at the original Sushi Zo way back in 2008 and I don't think I've had a bad piece since. 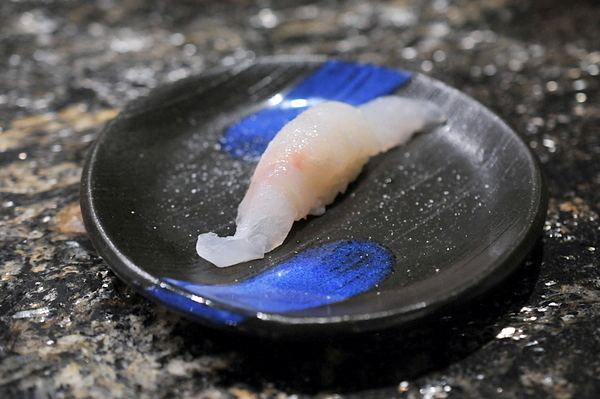 Still a relative rarity, the fish is generally confined to higher end restaurants. Unlike the more ubiquitous Red Snapper, the Golden Eye is threaded with fine white lines of fat and has a correspondingly richer flavor with a lingering buttery finish. This was the first real misstep of the night. I don't know if it was slightly cooked by the heat from the fresh batch of warm rice or just an odd piece but the liver had a rather dry texture and pronounced egginess to it. One of my companions said it reminded him of Jack in the Box tacos. Another relative rarity, I can only recall having this a handful of times whether seared or raw this is one of the most intensely flavored fishes around. Under the delicately scored steely blue skin there was a thick snowy layer of white fat with rich red lean meat underneath. The high fat content makes the Mackerel gives it an intensely soft texture and rich oily gravitas that feels almost steely on the finish. 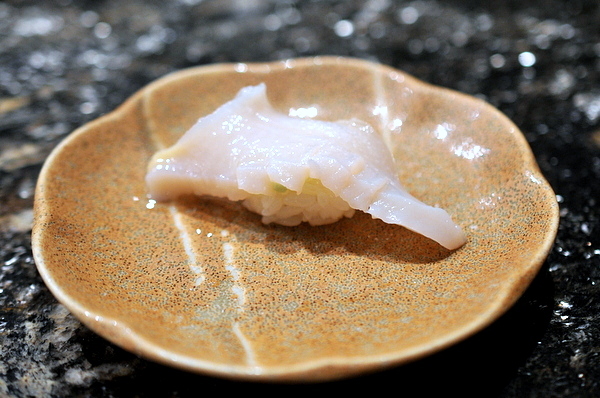 This was a very lightly seared slice of butterfish, the fish is still effectively raw with a supple creamy texture but not much intrinsic flavor giving the sweet white miso sauce had free reign. Though I typically prefer my meat as raw as possible, I think a bit more searing would have been effective here to give the fish a bit of smokiness. 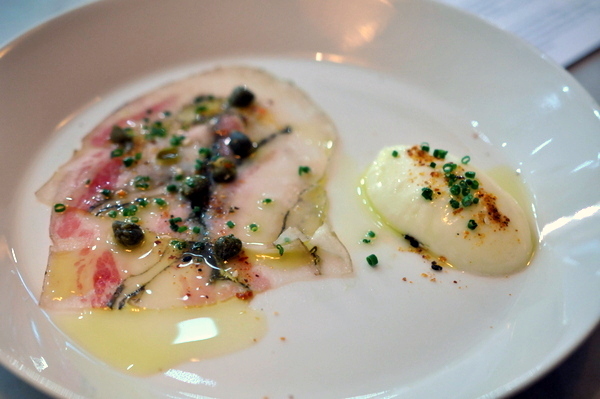 The truffle salt makes another appearance this time on top of a sliver of supple jellied Black Snapper. The fish's intrinsic flavor is masked by the pungent truffle to start but I did detect a slightly sweet flavor on the finish. 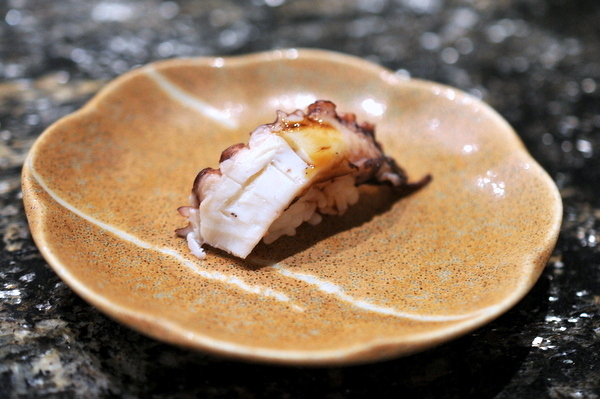 The octopus came steamed giving it a soft tenderness as well as a light ham like smokiness. The smear of thick brown sauce is Tare, a sauce normally reserved for eel but that worked very effectively here taking on an almost caramel like character in combination with the eel. 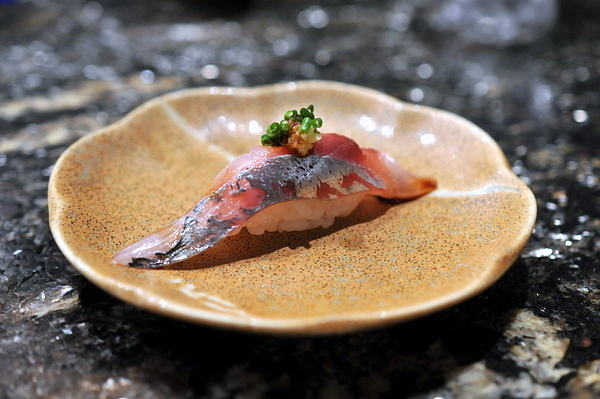 Sometimes also referred to as Spanish Mackerel, this isn't the more popular version found at almost every sushi restaurant. 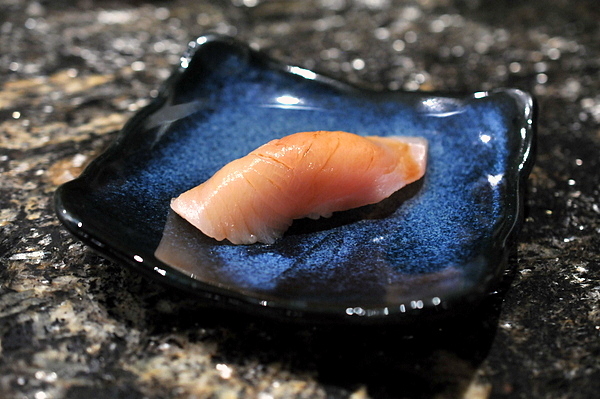 Instead the sawara has a drier more segmented texture with a sweet oily savor. 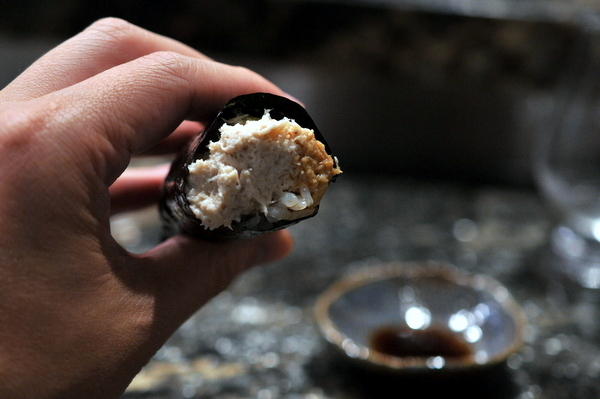 Next up was a generous slab of crunchy giant clam. The meat has a twinge of earthiness mixed in with the typical salinity. The minimal adornment lets the natural flavor of this little ivory gem shine. I've seen this translated as cuttlefish, but our itamae referred to it as Ink Squid. In contrast to the more common ika, the Sumi Ika's texture doesn't break down into the typical creamy feel but remains dense and distinct. 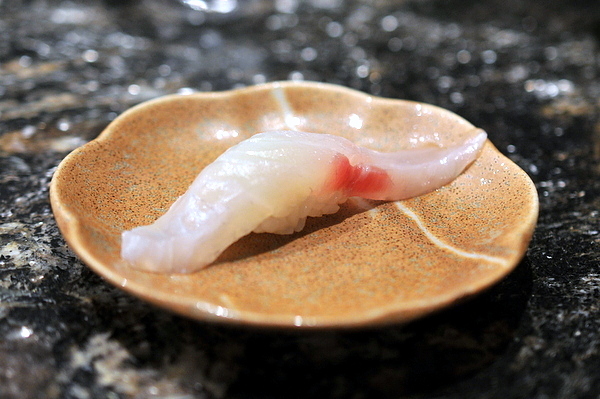 Madai commonly appears early in the meal so I was a bit surprised to see it here. 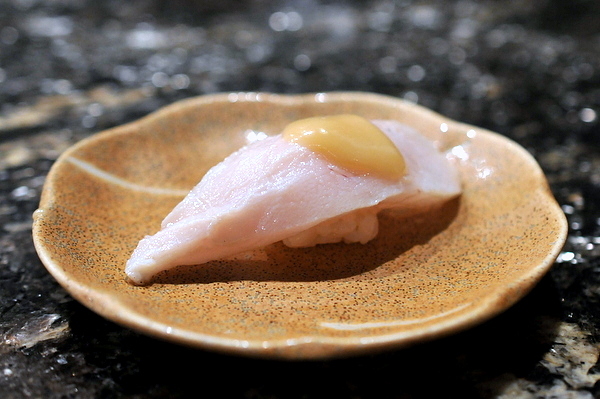 The fish is dusted with a bit of salt and finished with a squeeze of yuzu. 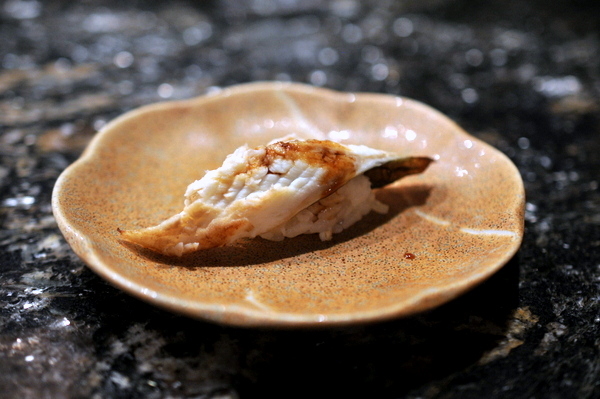 The salty twang of the fish is finished with brief flashes of wasabi heat on the finish. 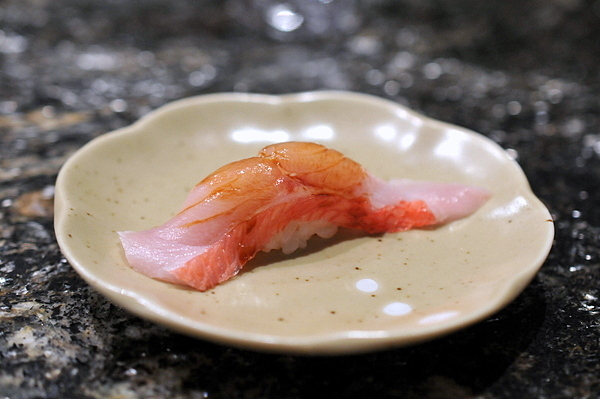 Typically one of my favorite fishes, the Shima Aji was delicious but had lots of stiff competition here. 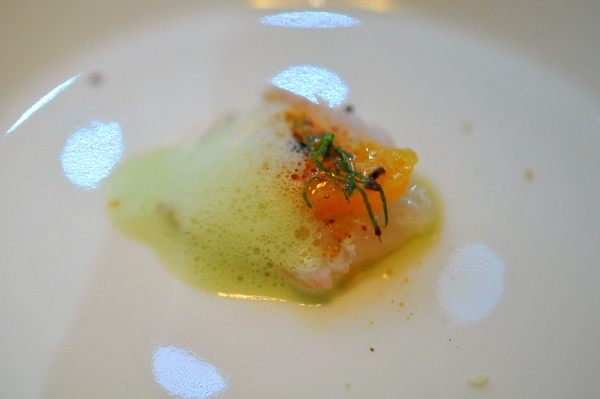 The fish looked a lot like the hamachi we had earlier but with a more sophisticated blend of sweetness and oily savor. 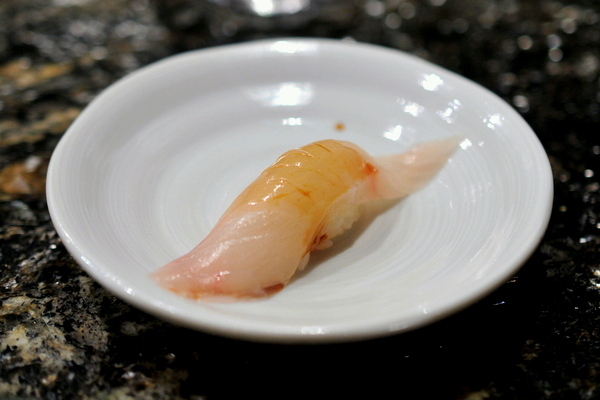 Next up was a beautifully translucent live sweet shrimp. The piece displays a short lived snap but becomes soft and creamy as it warms. 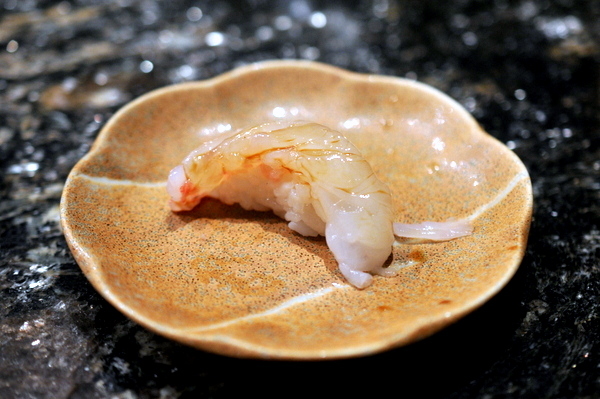 A light brush of soy highlights the shrimp's natural salinity. Next up was a duo of roe. Masa recommended we start with the San Diego uni, the golden roe liquifies immediately becoming a cool sweet slurry of rich offal-tinged majesty. The marinated salmon eggs were cool and snappy. Popping the little globules releases a rush of cool lightly smoky liquid that reminded me of a chilled dashi. When I saw the Anago I knew this meal was winding down. 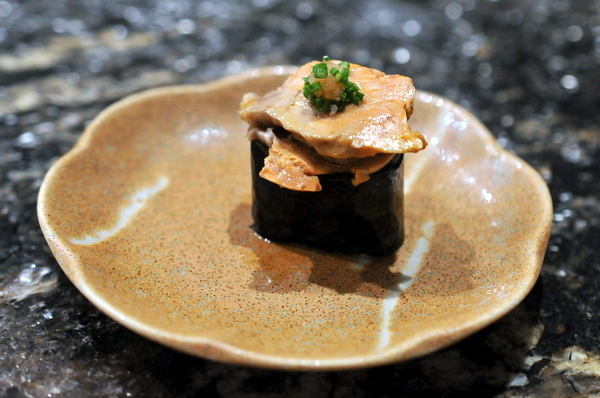 The warm Anago almost breaks down immediately as soon as its popped in the mouth. The eel has a clean savor to it mixed with the sweetness of the accompanying sauce. A fairly pedestrian piece of fish, Masa seemed almost reluctant to serve this to us but we kept asking if there was anything we hadn't tried. The Scottish Salmon runs towards the sweet side thanks to the translucent sliver of jammy sweet kelp and the lack of soy. The final piece of the night was a lightly boiled red snapper. The texture felt much more pronounced than the adult snapper's. The mild flesh had a slight savor touched with the clean acidic twang of lemon. Masa asked if we were still hungry and when we said that we were he immediately started working on some hand rolls for us. In contrast to the rest of the meal we were responsible for seasoning the rolls ourselves. I was a bit heavy handed with my first bite but the roll definitely needs some soy to bring out its full potential. The final savory dish of the night was a generously filled blue crab hand roll. The shredded crab meat comes in a lightly creamy sauce. Delicious on its on though, sparing dabs of soy also work very effectively with the vibrantly sweet shellfish. Having eaten every type of fish the restaurant had on hand we reluctantly signalled an end to the meal. As always the finalThe egg was on the savory side with a pronounced hamminess coupled with a light syrupy sweetness. 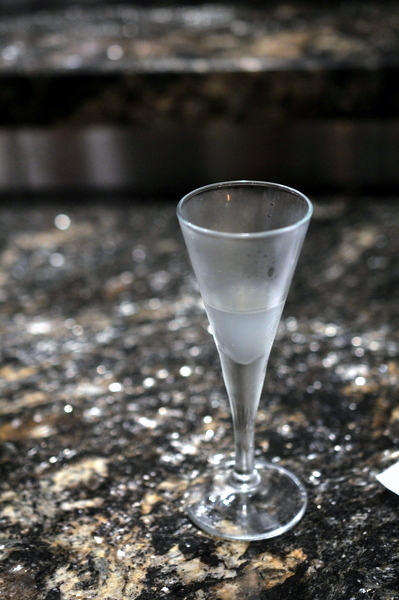 It wouldn't be a real meal at Zo without a shot of sweet yuzu juice to refresh the palate. The small shot is just enough to do the job but always leaves me wanting more. I've heard that with the new Zo comes a nicer Keizo and our interactions with him throughout the meal seem to bear out that assertion. Though he wasn't our itamae, I noticed him laughing and joking with the guests in front of him he checked in on us periodically throught the meal and even smiled for the picture at the end. 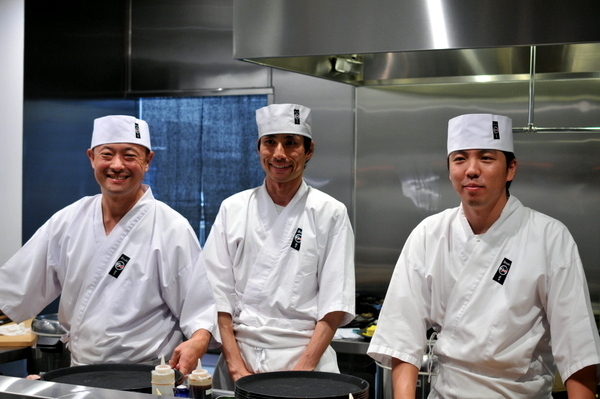 Our chef was Masa the young man on the far right of the photo who used to work at Nana-san in Orange County (perhaps the impetus for adding pompano to the menu). In the middle was Yuji who assisted Masa through much of the service. 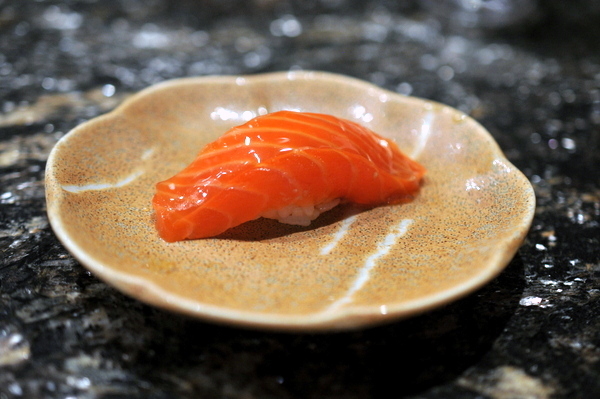 For veterans of the original Sushi Zo much of the food will be familiar though with perhaps a touch more precision. 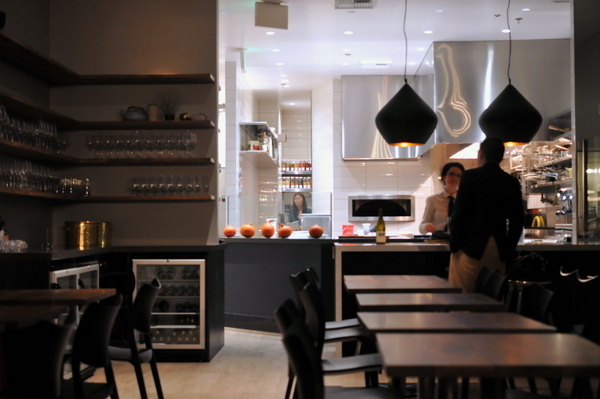 While the food might not be particularly different, the atmosphere is markedly improved. 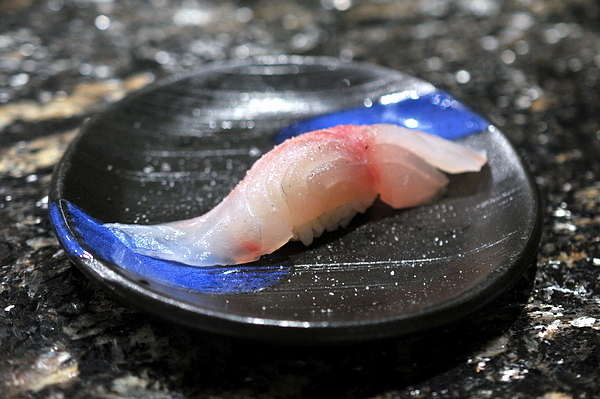 Where the old Zo could feel a bit intimidating in the same way that Nozawa did, Zo 2.0 seems to make every effort to set diners at ease from the frendlier chefs to the more relaxed pace between pieces of nigiri. 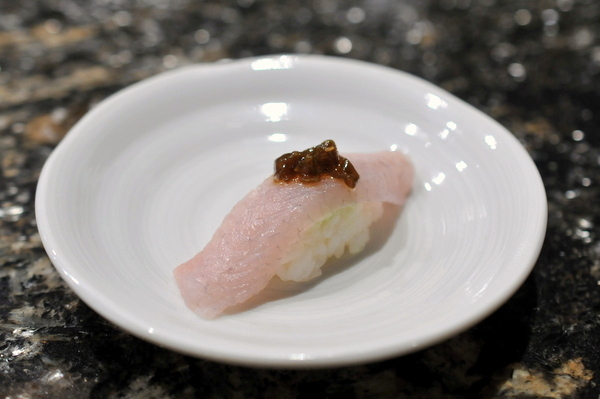 In summary, the new Zo does everything the old one did and more; the quality of fish makes the meal one of LA's premier omakases but with a touch more refinement and attention paid to the overall experience.